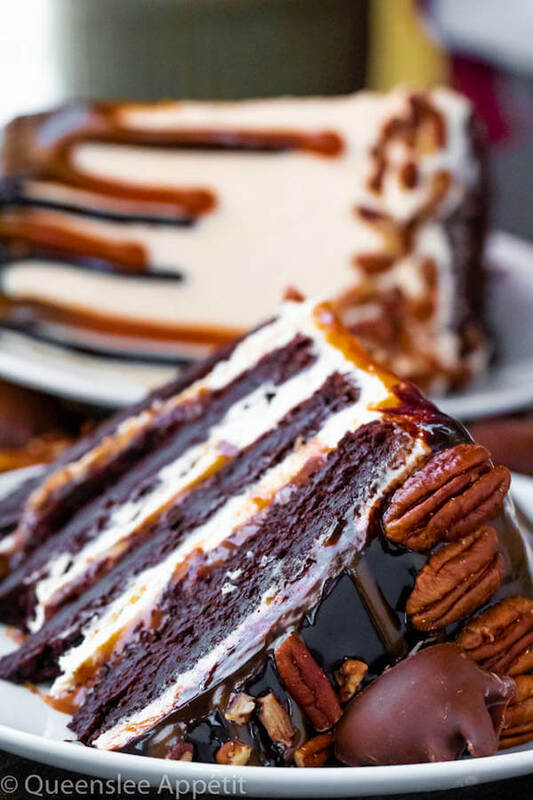 This Turtle Chocolate Layer Cake starts with rich, decadent and moist chocolate cake layers that are filled with a caramel pecan sauce and covered in a smooth caramel frosting, then finished off with a caramel and ganache drip and chopped pecans! Why hello there, delicious! I’ve been wanting to make a Turtles flavoured dessert for soooooo so so long now! I made this cake a few weeks ago, but I wanted to get all my Valentines Day desserts out of the way before sharing this beauty. 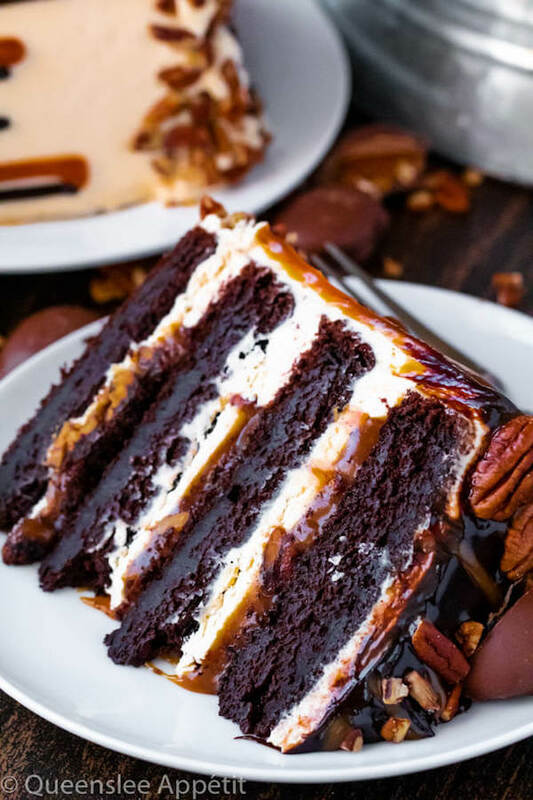 This Turtle Chocolate Layer Cake features four layers of moist and fudgy chocolate cake layers, filled with salted caramel buttercream frosting and a homemade salted caramel pecan sauce! 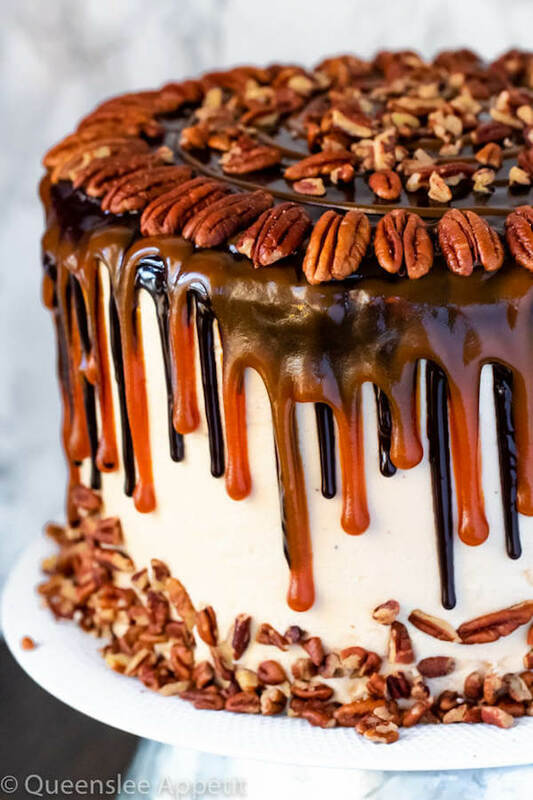 The outside is covered in more salted caramel frosting with a delicious ganache and salted caramel drip and chopped pecans to finish it all off! If that doesn’t sound absolutely tempting, I don’t know what does! 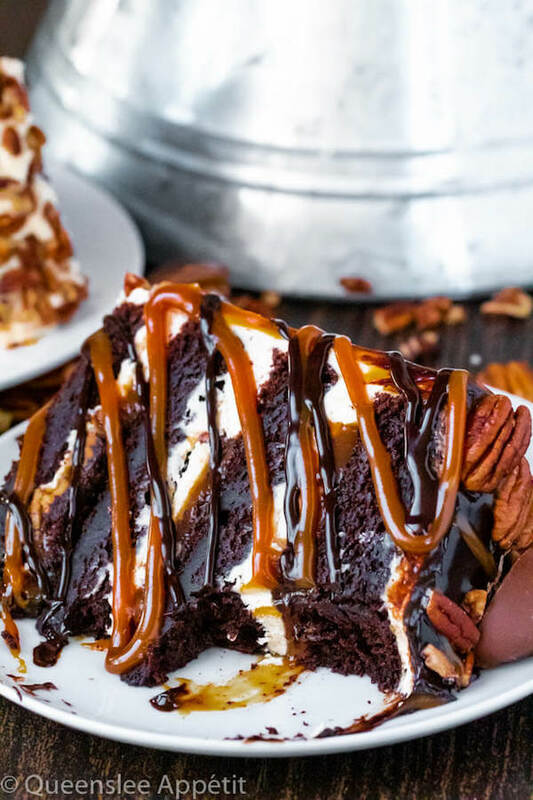 Although this is a Turtles cake, there actually aren’t any turtles in this recipe. And by turtles I mean the chocolate candy, not actual turtles. I just couldn’t find anywhere to add them, and if we’re being honest, between all of the incredible layers, they weren’t really needed. Now I did actually have plans to add turtle chocolates to the cake, so I bought quite a few packs. Since I changed my mind last minute, and didn’t want the chocolates to go to waste (I had to resist eating them all) I decided to create another turtles dessert which I’ll be sharing sometime soon, so look out for more Turtle deliciousness! This recipe starts with 4 layers of moist chocolate cake. 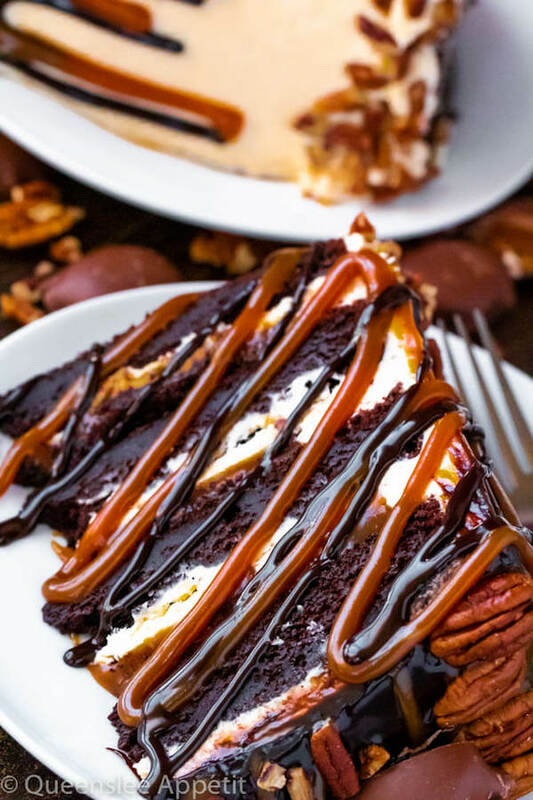 Now this is a brand new chocolate cake recipe that I’ve never used before! In all of my previous chocolate cake and cupcake recipes, I did a simple method of combining dry ingredients with wet ingredients and a bit of hot water. That method was super easy and resulted in a super moist cake. However, I found that the cake layers weren’t very stable and fell apart very easily while handling, so I decided to create a butter-based chocolate cake recipe that’s a bit more firm and dense. The first step in making the cake layers is to sift the dry ingredients together. We use a full 1 and 1/2 cups cocoa powder which may seem like a lot, but there’s 4 layers of cake so it’s the perfect amount. The next step is to cream the butter and sugar together. This step is very crucial because it adds air to the batter and gives it a nice fluffy texture! Please do not skimp on the creaming, the butter and sugar need to be super pale and fluffy so do not move onto the next step until it reaches that stage. This takes about 4-5 minutes for me, but it may take longer depending on the softness of your butter. Next we add the eggs, one at a time, then some sour cream for extra moisture and tenderness. For the flavouring, I combined equal amounts of vanilla extract and instant coffee granules so the coffee can dissolve in the vanilla. The coffee is optional but it heightens the rich chocolate flavour! In my other chocolate cake recipes, we would add hot coffee or boiling water at the end which did the same thing, but we aren’t adding that to this recipe so the coffee granules are a great substitute. Lastly we’re gonna alternate between adding the dry ingredients in three additions and then add the buttermilk in two additions. So dry, then wet, then dry etc. This keeps your batter nice and smooth while mixing. Speaking of which, this batter is so gorgeous, I wish I took a photo! My previous chocolate cake batter was very thin (as it should be), but this cake batter is nice and thick and silky, I was so tempted to just dip my finger in! Loyal readers get used to this recipe, because it’s definitely gonna be my go-to from now on! Aside from the chocolate, the main flavour of a Turtle candy is the caramel and pecan filling. 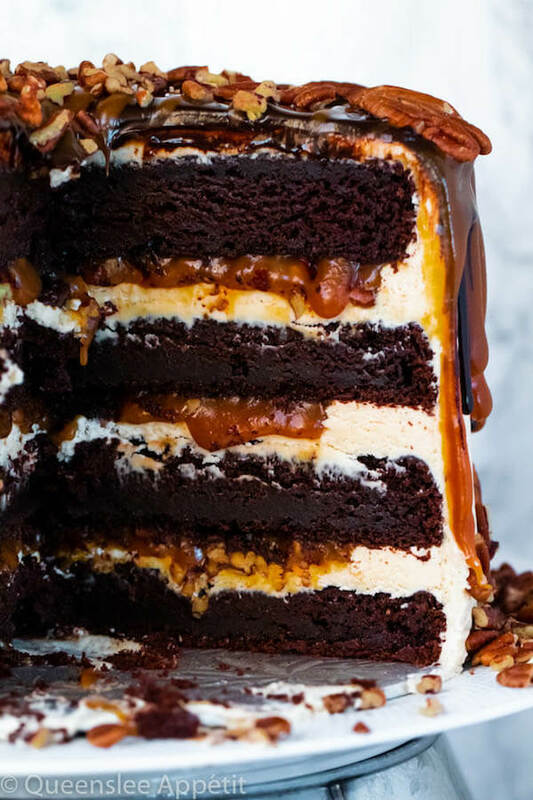 So sitting between these layers of fudgy chocolate cake is a pecan caramel sauce filling! We start by making a double batch of my Homemade Salted Caramel Sauce, which is totally fool-proof. I’ve included a detailed explanation about how caramel sauce is made in the post, but basically it requires 4 ingredients: granulated sugar, butter, heavy cream and salt. Start by melting the sugar in a medium saucepan, then stir in the butter, let it boil, slowly pour in the cream, let it boil some more, then remove from the heat and add the salt. Super easy! 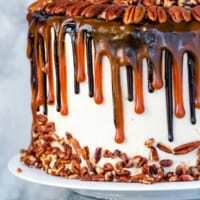 After making the caramel, I added a cup of chopped toasted pecans and let it cool in the refrigerator overnight. Yes that means you can make it ahead of time, hooray! Also sitting between those layers and covering the entire cake is my super fluffy and tasty salted caramel buttercream frosting. 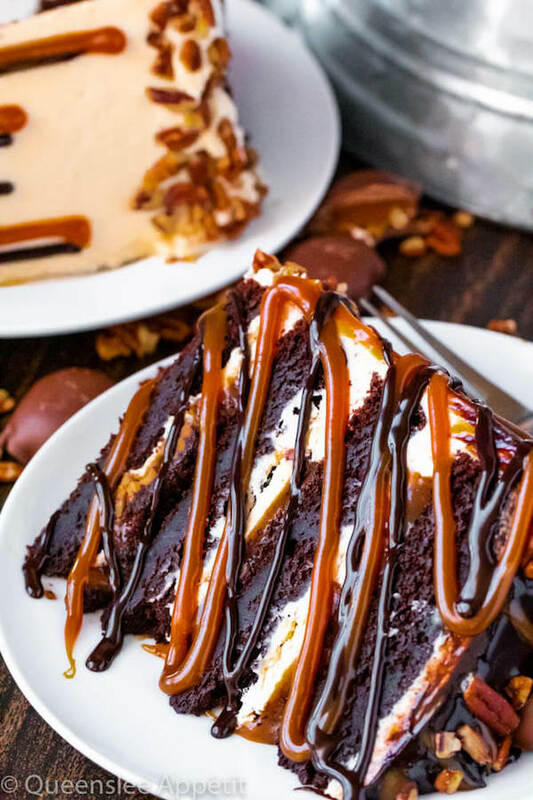 It’s your average American buttercream recipe with loads of homemade salted caramel sauce (did I mention you have to make a second batch?) mixed right in. Now for my birthday cake recipe, a few people were alarmed by the amount of frosting the recipe makes. I mean, 3 cups of butter and 12 cups of icing sugar does sound like much, but it’ll yield enough frosting to fill, frost and decorate the cake. 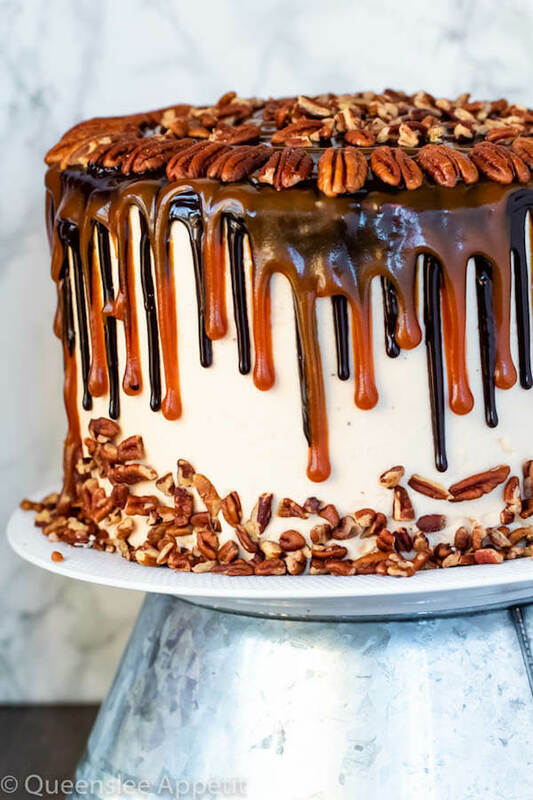 Why choose between a ganache drip or a caramel drip when you can have both?! I made a simple 2-ingredient ganache and dripped it over the edges of the cake and poured the rest in the middle. To get the most perfect drips, I poured both the ganache and caramel into separate disposable piping bags and cut off a small tip. Gently squeeze it on the top edges and let gravity do the rest. Then repeat the same thing with the caramel sauce. Now here’s the thing, as I mentioned above, I had initially planned on adding some Turtle chocolates to the cake. So I made the sad mistake of piping buttercream rosettes on top of the cake. And because of the caramel sauce….they all slid down. Well actually only one slid down because it started sliding immediately after I piped it on so I nuked the idea right away. Luckily I caught the poor rosette before it could ruin the cake, but I did have to pour some more ganache on top to cover the mess on top. Pecans, Pecans and more Pecans! Since the Turtle rosette border was a total bust, I decided to decorate the cake with pecans! I mean, it’s one of the 3 main flavours of a Turtle chocolate, so why not? I forgot to mention that I pressed some chopped pecans onto the bottom of the cake before I did the drip. See back when I made this cake, I sucked at pressing things into the bottom of cakes, whether it were sprinkles, chocolate chips or pecans. My hand would always leave a dent or everything would fall off, so I would have to individually press them on. Fortunately, I made a birthday cake for a client a few days ago and I had to do the same thing with sprinkles, but this time I discovered the perfect method! After frosting the cake, I let it chill in the freezer for a few minutes, then I spread a thin layer of frosting on the area I wanted to add the sprinkles. This way I could press the sprinkles onto the fresh buttercream without worrying about leaving a dent because the coating is solid! 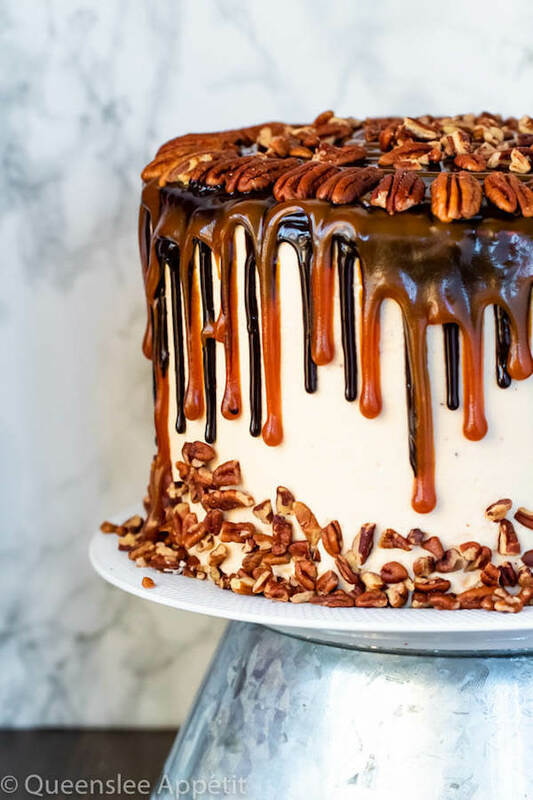 I highly recommend using this method when adding the pecans to the bottom of this cake. It’s also good for your cake to be chilled before you add the drip, that way the ganache will set up quicker. And to finish the top of the cake off, I made a border with the extra pecan halves I had and sprinkled some more in the middle. 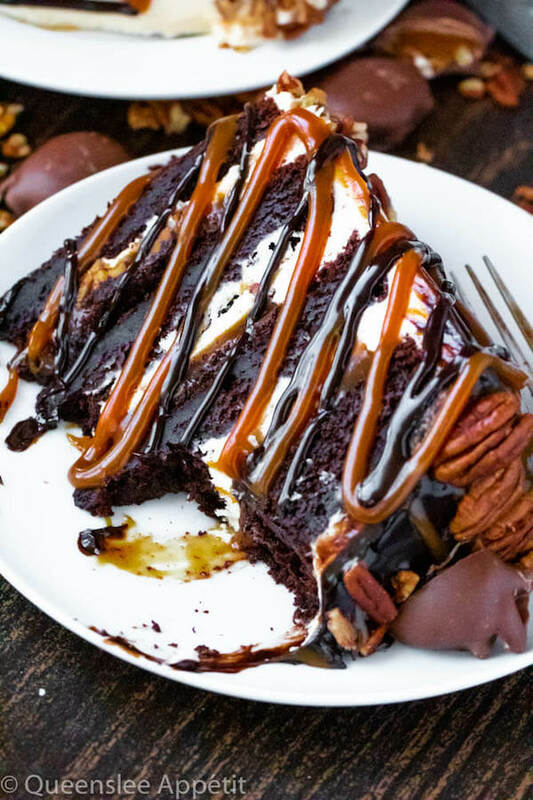 Nice and simple and super decadent! I can’t wait for you guys to try it. Like what you see? 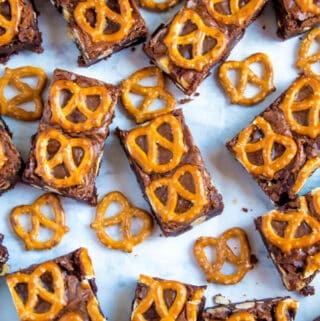 Make sure you‘re following Queenslee Appétit for more tasty recipes! Have any questions about the recipe? 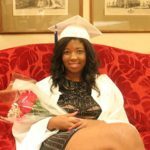 Contact me here, and I’ll be happy to help! For the Toasted Pecans: Preheat oven to 350°F and line a baking sheet with parchment paper or a silpat mat. In a small bowl, melt 2 tablespoons of butter in the microwave for about 30 seconds. Drizzle the melted butter onto the pecans and toss together to coat pecans. Spread pecans onto prepared baking sheet and bake in oven for 5-6 minutes until toasted and fragrant. Remove the pecans from the oven and roughly chop. Set aside. For the Caramel Sauce: Add the sugar to a large heavy-bottomed non-stick saucepan and heat over medium heat, stirring constantly using a heat resistant rubber spatula or a wooden spoon until the sugar is melted and turns a medium amber caramel colour. Don't worry if the sugar clumps up, just keep stirring and it will melt smoothly. Keep a close eye on the pot as the sugar can easily burn, and you would have to start over again. As soon as the caramel turns a deep amber, add the butter cubes, whisking constantly until butter is melted and fully combined. Once butter is combined, slowly pour in the heavy cream while whisking vigorously, be careful as it will begin to bubble up furiously. The caramel may begin to clump together if your cream is too cold. If so, just continue stirring until caramel melts back down. Allow caramel to boil for 1 minute, then remove from heat. Stir in the vanilla (optional) and salt. You can leave out the salt if you don’t want the caramel to be salted. Add the chopped toasted pecans to the caramel sauce and stir until combined. Let caramel cool to room temperature before pouring into a jar or an airtight container. Set aside or store in the refrigerator until ready to use. Repeat the above steps 5-8 to make another smaller batch of salted caramel sauce. Set aside to cool completely or store in a jar or an airtight container in the refrigerator until ready to use. Preheat oven to 350° F (177°C). 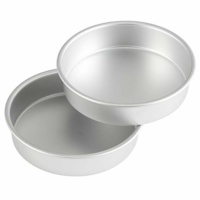 Prepare four 8-inch round cake pans with parchment rounds, and grease the sides. Set aside. In a large bowl, sift flour, cocoa, salt, baking powder and baking soda. Whisk to combine, set aside. 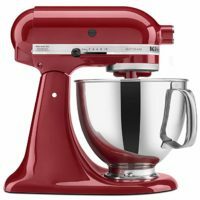 In the bowl of a stand mixer fitted with a paddle attachment, beat the butter and sugar on medium speed until pale and fluffy, 4-6 minutes. Scrape down the sides and bottom of the bowl. Lower the speed to medium-low and add eggs one at a time, mixing after each addition until just combined. Scrape down he sides and bottom of the bowl. In a small bowl, combine the vanilla and instant coffee granules. Add the sour cream to the batter along with the vanilla coffee mixture and beat on medium speed until combined. Alternately add dry ingredients in thirds and buttermilk in 2 additions to the batter, beginning and ending with the dry ingredients. Beat each addition just until combined. Divide batter equally between the cake pans, a little over 2 cups per pan. Bake two layers at a time for 20-25 minutes or until a toothpick inserted into the center comes out clean and cake springs back when lightly touched. Remove cakes from oven and allow to cool in pans for about 10 minutes, then turn onto cooling racks to cool completely before frosting. Or at this point, you can wrap all the cake layers tightly in plastic wrap and freeze or refrigerate until ready to assemble. In the bowl of a stand mixer, beat the softened butter until super pale and fluffy, about 5-6 minutes. Scrape down the sides and bottom of the bowl.Add half of the powdered sugar, one cup at a time and beat on low speed after each cup until combined. Once combined add cooled salted caramel sauce and continue to beat until combined and smooth. Add remaining powdered sugar one cup at a time, mixing on low speed until it’s all combined. 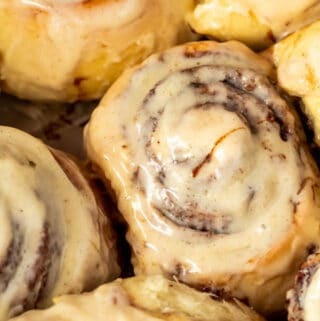 If the frosting is too thick, add heavy cream 1 tablespoon at a time until you reach the desired consistency. Increase speed to medium-high and beat for about 5-7 minutes, or until frosting is light and fluffy. Put the chocolate chips into a medium bowl. Set aside. 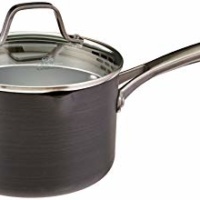 Heat the heavy whipping cream in a small saucepan until it just begins to boil. Remove hot cream from heat then pour it over the chocolate chips. Cover the bowl and allow it to sit for 5 minutes. Remove cover and stir ganache until smooth. Set aside to cool. 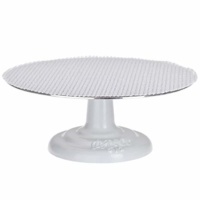 Use an offset spatula to place a dollop of frosting onto a cake board or serving platter that’s on a turntable. 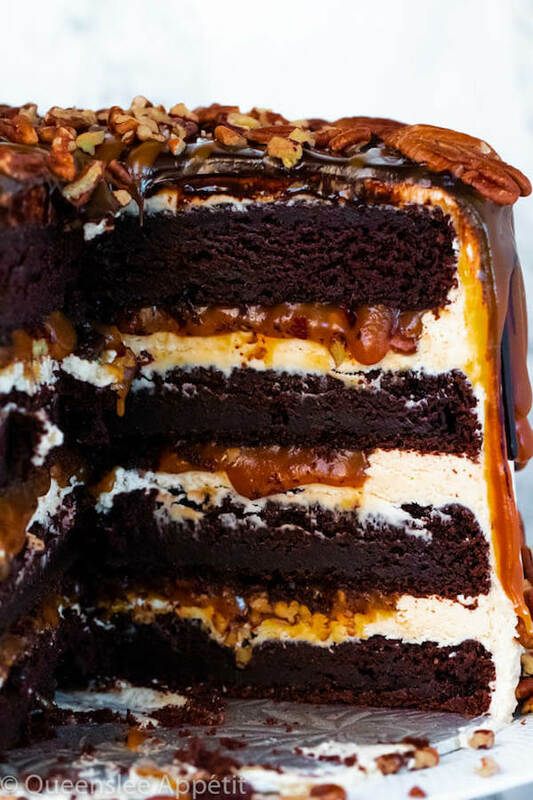 Place one cake layer on top and spread about 1 cup of the salted caramel buttercream on top of the first layer. Scoop some frosting into a disposable piping bag and snip off the end. 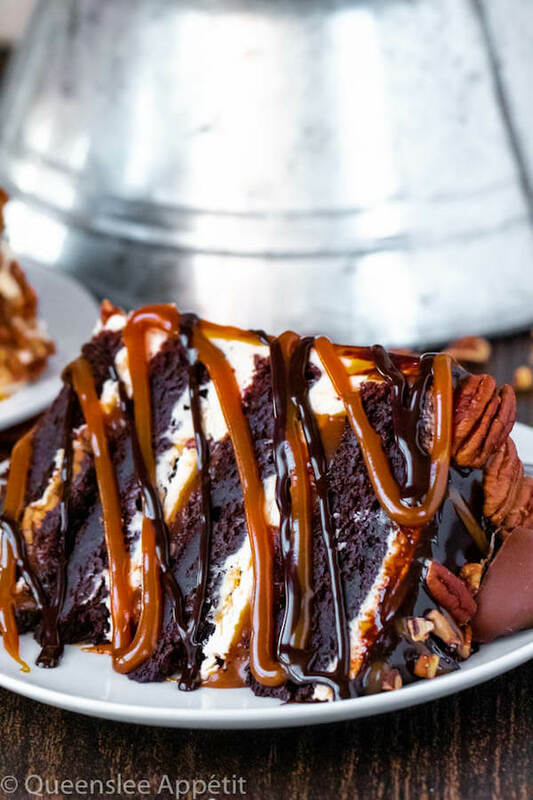 Pipe a rim around the edges of the cake and pour on a cup of the pecan caramel sauce and spread into an even layer. Repeat with all layers, placing the final layer upside down. 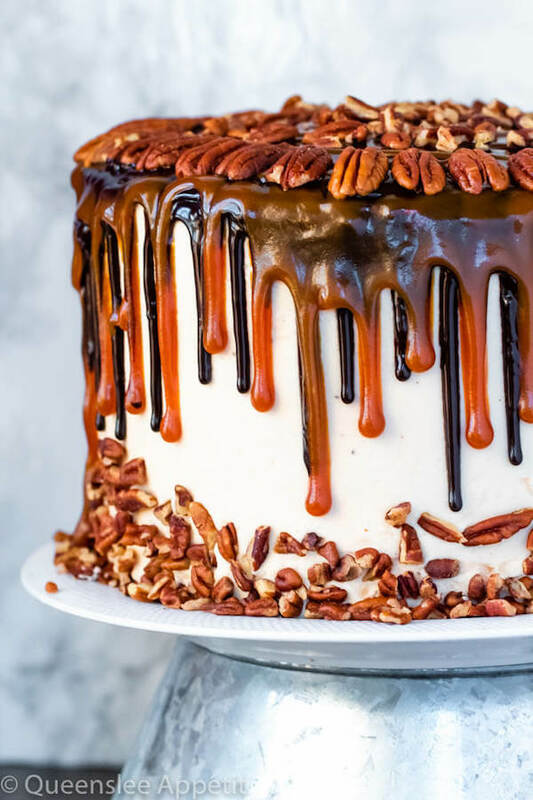 Frost the entire cake with a thin layer of salted caramel buttercream. Chill the cake for 30 minutes. 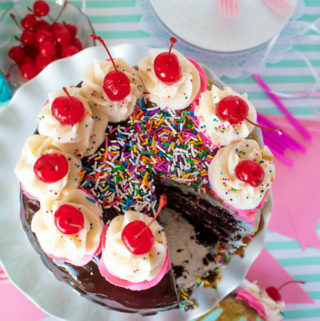 Remove cake from refrigerator and frost the entire cake with a thick layer of frosting. Chill cake in the refrigerator for another 30 minutes or in the freezer for 10-20 minutes. Remove and spread a thin layer of frosting onto the bottom of the cake. Press the chopped pecans up the bottom so it can stick onto the fresh frosting. Pour ganache and remaining caramel sauce into separate disposable piping bags or a ziploc bag and snip off the tip. Drip the ganache off the edge of the cake and fill the center. 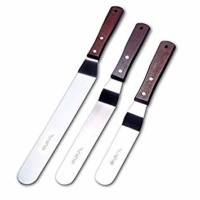 Use an offset spatula to to spread the ganache over the top. Repeat these steps with the caramel sauce, pouring it on top of the ganache. Line some pecan halves around the top to create a border and sprinkle more chopped pecans in the centre. Slice and serve! 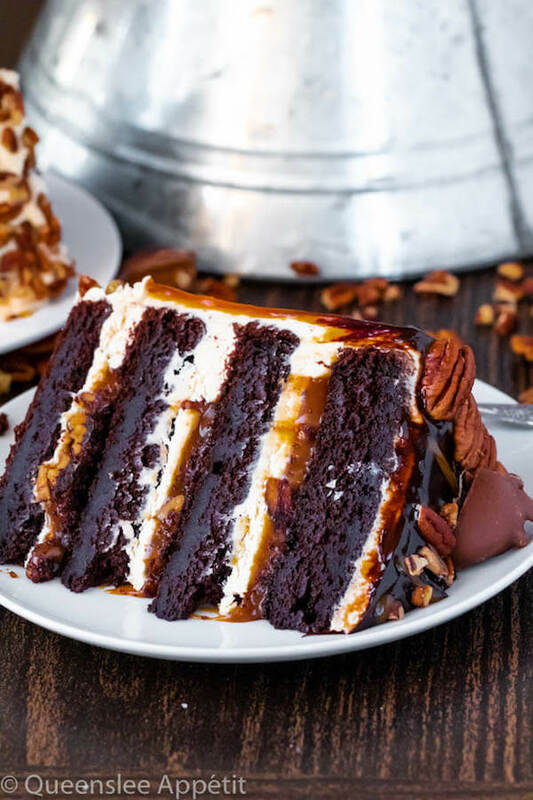 Make ahead: (1) Cake layers can be made ahead of time and double-wrapped in plastic wrap and stored in the refrigerator or freezer. 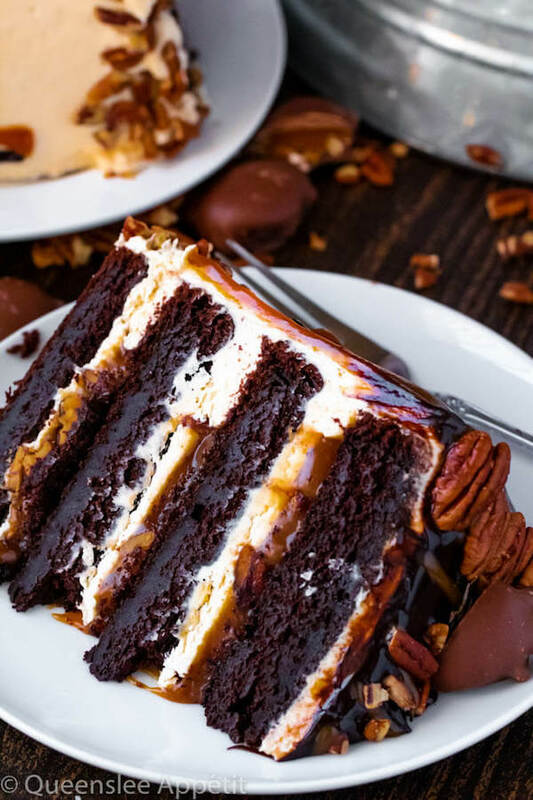 (2) Caramel Pecan Filling and Salted Caramel Sauce can be made ahead of time and stored in an airtight jar in the refrigerator. Microwave in 30 second intervals until the caramel is smooth and pourable again. 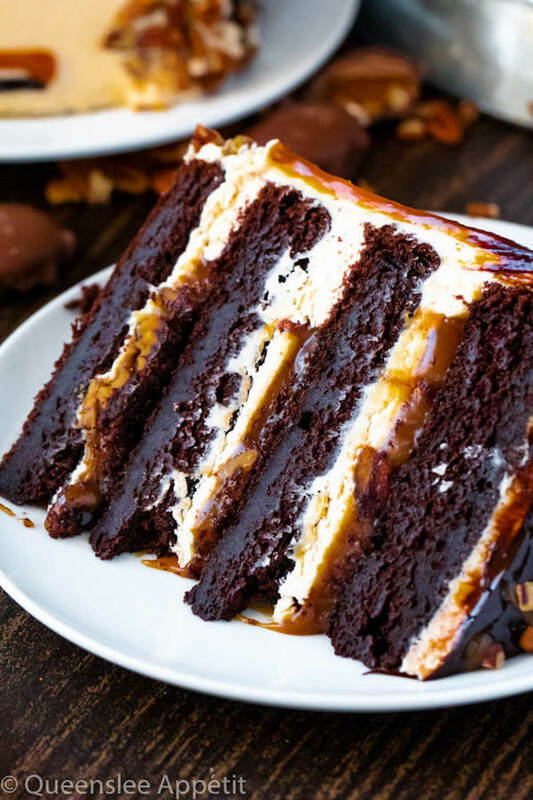 (3) Caramel Frosting can be made ahead of time and stored in an airtight container in the refrigerator for up to 1 week, or in the freezer for several months. 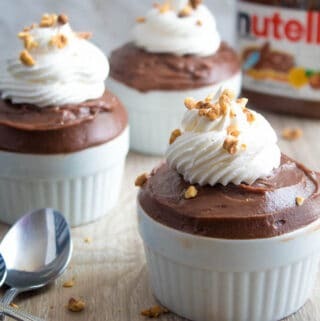 Before using — allow frosting to come to room temperature, then re-whip in a stand mixer or with a hand mixer until the frosting is smooth and fluffy. 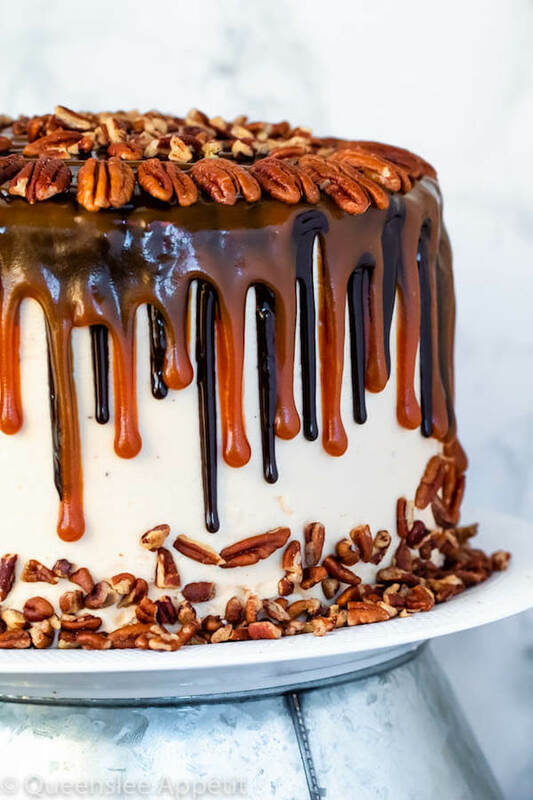 You may have some frosting left after decorating, but I do not recommend piping a border on top of the cake because it’ll push the caramel down causing the frosting to slide off. Store cake in an airtight cake storage in the refrigerator for up to 1 week. Bring to room temperature before serving. I’d love to see how it turned out! Follow me on Instagram and use the hashtag #queensleeappetit so I can see all of the Queenslee Appétit recipes you’ve made! ©QUEENSLEE APPÉTIT. All images & content are copyright protected. Please do not use my images without prior permission. If you want to republish this recipe, please re-write the recipe in your own words, or link back to this post for the recipe. Hello! I’m Dedra, welcome to Queenslee Appétit! Subscribe to get recipes delivered straight to your inbox!